While this turkey requires a bit of prep work, by creating the rub and then letting the turkey sit for about a day ahead of cooking, you will be happy you put in the extra effort. The chili rub is full of deep flavors and just a little spicy. It contrasts perfectly with the sweet fruity oranges the turkey is stuffed with. Just wait for the aromas wafting through the kitchen! So, if you want to add a little spice to your holiday dinner, try out this non-traditional turkey recipe. One of the biggest holiday dinner cardinal sins is not buying enough food for the number of guests around your table. In order to avoid that issue I abide by the rule of thumb of buying about 1¼ - 1½ pounds of turkey per person. If you are someone who likes to have plenty of leftovers to make sandwiches and turkey hash then lean more towards 1½ pounds per person. Plus I like to tack on an extra pound or so just to account for any last minute guests that may show up. 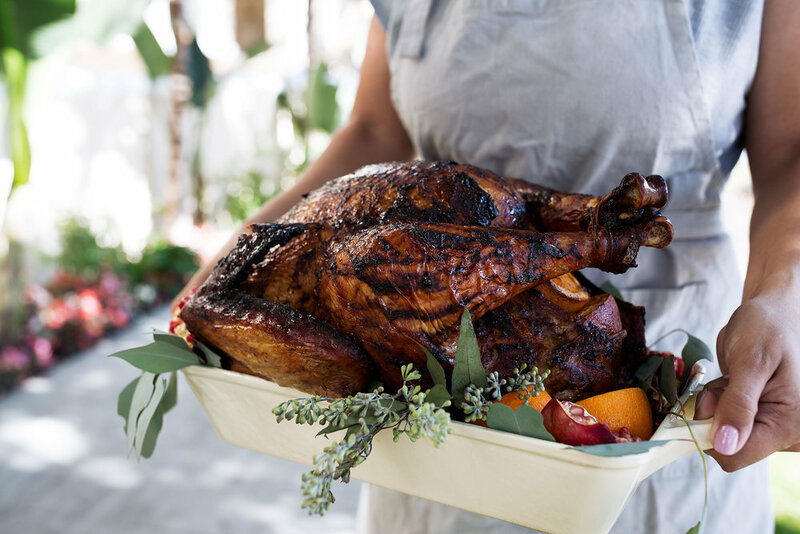 This enamel roasting pan from Home Depot is perfect for roasting smaller turkeys such as used in this recipe. I add a small rack to the bottom of the pan so the fat can drip through as the turkey skin crisps. To make the chili rub, add the chilies, cumin, coriander, onion and garlic to a medium saucepot over medium heat. Add 1½ cups of water and bring to a simmer until the chilies and onion are soft, about 15 minutes. Remove from heat and let cool, then puree with the orange zest and sugar in a blender until smooth. Add to a bowl and set aside to cool completely. One day before you are planning to roast the turkey, rub the turkey all over with salt and pepper. Use your fingers to gently separate the skin from the meat and rub the salt under, being careful not to break the skin. Use half of the chili rub and massage it all over the turkey, including under the skin and the underside of the turkey. Place the turkey in the roasting pan and cover with aluminum foil. Refrigerate for 24 hours, turning the turkey once. One hour before you are ready to roast, remove the turkey from the refrigerator and pat it dry inside and out with paper towels. Clean the roasting dish and set aside. Let the turkey stand at room temperature for 45 minutes, this allows for the turkey to cook evenly. Rub the ¼ cup of the remaining chili rub all over the turkey then add the halved oranges into the inside of the bird. Heat the oven to 350°. Set a rack inside a large roasting pan. Tuck the tips of the wings under the bird. Pour the beer, stock and 2 cups of water into the bottom of the pan. Add the reserved turkey neck and giblets to a small saucepot filled with water over medium heat. Simmer over medium low heat, adding additional water as necessary. Roast the turkey uncovered for 30 minutes. Remove the turkey from oven and baste the turkey with the stock from the saucepot. Add more water to the bottom of the pan if needed to keep it at ¼-inch. Continue cooking and basting the turkey every 30 minutes for about 4 hours until the internal temperature of the turkey registers at 165°. Transfer to a cutting board and the turkey let rest for 30 minutes before carving. Serve with your favorite stuffing on the side. **Note: If there isn’t room in your refrigerator for such a large container, put the turkey and brine into a 5-gallon plastic brining bag, seal or tie shut then put the bagged bird into a cooler filled with ice, replenishing it as needed to keep the temperature at 40 degrees. This sponsored post was created in partnership with Home Depot – all opinions expressed are my own. I acknowledge that The Home Depot is partnering with me to participate in the promotional program described above (the“Program”). As apart of the Program, I am receiving compensation in the form of products and services, for the purpose of promoting The Home Depot. All expressed opinions and experiences are my own words. My post complies with the Word Of Mouth Marketing Association (WOMMA) Ethics Code and applicable Federal Trade Commission guidelines.